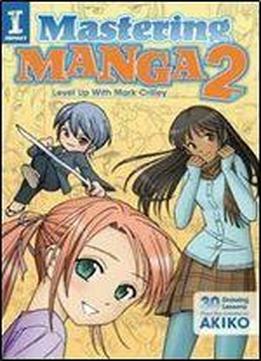 Level UP and master more manga with YouTube's most popular art instructor, Mark Crilley! It's here! The highly anticipated follow-up to the best-selling Mastering Manga provides everything you need, regardless of your skill-level, to learn how to draw manga like a pro. Graphic novelist and YouTube's most popular art instructor Mark Crilley is back to lead you on your artistic journey. No matter what your experience, Mastering Manga 2 will have you creating manga in no time. You'll master the basics of facial and body proportions as your drawing skills increase to the next level. Clear and easy step-by-step instruction will walk you through the mechanics of how to draw manga. You'll learn to create characters in diverse settings and scenes, as well as a variety of styles. Lessons on background and perspective will help you pull it all together into a full manga story panel. More than 30 step-by-step demonstrations! Proportion. Learn to draw all types of bodies, faces, ages and ethnicities in profile, from behind, and more, including how to turn a full-sized character into an adorable chibi. Clothing and body language. Reveal your character's personality through hairstyles, expressions, clothing styles and accessories. Useful poses. Tweak 16 classic manga poses to make them your own, or follow along with specific step-by-step demonstrations on drawing characters sitting, fighting, kissing and more. Environments. Create all types of habitats and moods using forest elements, rain, and the effects of water and weather. Anatomy of a manga panel. Learn how to choose the correct composition, background, depth and balance to create the most effective panel layout for your story. Grab a pencil and learn all the secrets needed to bring your manga story to life!